Traditional falafel technique and non-traditional seasoning combine in these delightful dill chickpea fritters. I didn’t set out to reinvent falafel. I don’t think it needs to be reinvented at all, frankly – lovely crunchy balls or patties full of flavor! A wonderful, and traditional, vegan meal! But see, I wasn’t planning to make it that day, so I didn’t have the ingredients. I first had falafel years ago at a vegetarian restaurant near my office that called them “burgers”. Soon I learned that the Kosher place down Broadway served a much better version, and that it was “falafel” – a Middle Eastern dish. It always sounded complicated to make – deep fried, after all! so I never thought to cook it at home. But some years later, I lived in a very diverse neighborhood in Jersey City, with a large Egyptian community. The local grocery store stocked Egyptian foods, I talked to my neighbors, and tried a few. I’m definitely a fan of Ful, cooked and seasoned Egyptian fava beans, considered the national dish of Egypt. But after a while, I didn’t go back to Jersey City often enough, so I hunted up recipes, and made my own – well, it’s really more dough than batter. Perfect for the Inhabited Kitchen way of cooking! 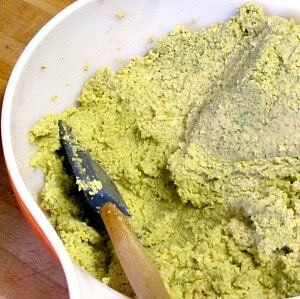 I make a large batch of the mixture, freeze it in meal sized portions, and fry it when I want it. The fritters themselves are best fresh – they get soggy if reheated. But back to that day a week or two ago. I had a cup of soaked chickpeas, I didn’t have parsley, or tahini, but I needed to use the last of a bunch of dill… Well, I made it for lunch. and liked it enough to make it again and write it up to share! 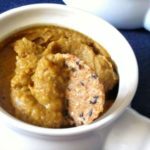 I’ve seen American recipes calling for cooked or canned beans – and then for an array of other ingredients to make the mushy patties hold together. No. You use uncooked soaked beans, grind them thoroughly, and they hold together well. The frying cooks them. But that means you need to soak them for a long time. Twelve hours is a good start, up to twenty four (or even a little longer!) is fine. When you clean up from dinner, set beans to soak for the next day, that will work. This softens them enough to grind. You can see how much they expand! (Make sure you use a large enough bowl!) 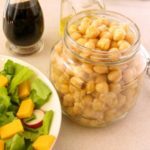 Wash and pick over a pound of chickpeas, and set them to soak twelve hours or more. I understand that traditionally people use a meat grinder, but a food processor works. First, put in aromatics – onion, garlic, and, well, in this case, dill. I used a red onion primarily because I had it, but the slightly less pungent flavor works well, here. You can use it or a yellow one. I also seeded and chopped a jalapeno to add zip. Run the processor until all that is roughly chopped. Then drain your beans. Now, a full pound of beans, soaked, do not fit in my processor, so I started with a little more than half of them, and ran the processor. This part is key – it’s not the short chop or blend we’re used to. Process this a good five minutes, all together, or even longer, to get the right texture. Stop at least every minute to stir down. 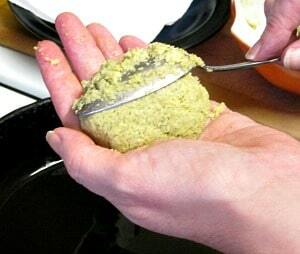 When it’s ready, it will have the consistency of paste or putty. At that point, assuming you also need two batches, scoop most of it out into a bowl, put the rest of the soaked beans in the processor, and repeat. Then scoop it all out into the bowl, and mix the two batches well. This amount makes roughly five cups of a thick, paste like dough. You’ll have some variation – how big was your bunch of dill or onion, how much did the beans expand – but count on around five cups. If you are feeding a large family, go ahead and fry it all, but I like having it in the freezer. I packaged most of it right up. And from here on in, I give directions for one cup of dough, which can be doubled or more. 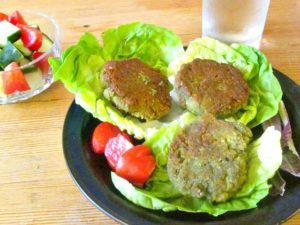 One cup makes six patties, which make a nice meal for one, or a snack or part of a Falafel Platter with hummus and other foods, for two. Take a frying pan large enough for the amount you will cook. The pictures show a 10″ pan. I would use a larger one to cook enough for two, and make two batches (or two pans) for more. Heat the pan, and add oil, about a quarter of an inch deep, enough to come up into the uneven parts of the fritters. Heat the oil over medium heat until a crumb of the mix dropped in sizzles and browns. Keep the heat medium – you don’t want the patties to burn before the middle cooks. For each cup of the dough, immediately before cooking, add a pinch of baking soda (that’s an eighth of a teaspoon – so a quarter teaspoon if you make two cups, and so on.) and mix it in. Then form into patties. I find the easiest way is to use a spoon and my hand to make little croquettes. (I’ve seen directions to do this with two spoons – I’m too clumsy.) Then carefully slide each patty into the hot oil. After a minute or two, the bottom forms a crust, and you can loosen it from the pan with a spatula – useful if you need to arrange them to make room for the last patty… And use the back of the spoon to flatten it slightly, so that it cooks evenly. The traditional version is served with tahini (another ingredient I didn’t have…) and either pita bread or rice. Or people commonly make up a plate with a few falafel and hummus. Plenty of vegetables, of course, always! (Health Salad is perfect.) We ate this with rice, as well as the cucumbers and tomatoes shown, and some yogurt, in lieu of the tahini. Delicious! 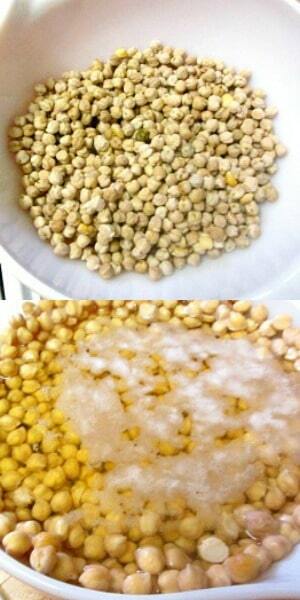 Wash and pick over the chickpeas. Place in a large bowl with plenty of water, and soak 12 - 24 hours. Trim, peal, and roughly chop aromatics. 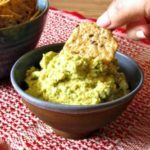 Put in a food processor, and whir until coarsely chopped. Drain chick peas. Place half in food processor. Process for 5 minutes, stopping to stir down every minute, or until ground into a smooth paste. Scoop most of it into a bowl, and repeat with the rest of the chickpeas. Combine the two batches, and mix well. If desired, freeze in one cup batches. When you want to eat them, take one cup per person. Mix in a pinch of baking soda for each cup - a quarter teaspoon for two cups. Heat oil in a pan. Form patties - one cup makes six patties - and place carefully in the hot oil. Fry about five minutes, until the bottom is brown, then turn over. Cook another five minutes or until the patty is firm to the touch, and fully cooked. Drain briefly on paper, and then serve at once. If you need to hold one batch while another cooks, place in a warm oven. Thanks! Now - don't get me wrong - I love the original, and that's what I usually make (and will continue to.) But I want to be able to make it when I don't have the "right" ingredient - as long as I have something that's not really wrong. Dill is the right kind of leafy herb, almost a vegetable, that I can use enough of... And we really did like them. 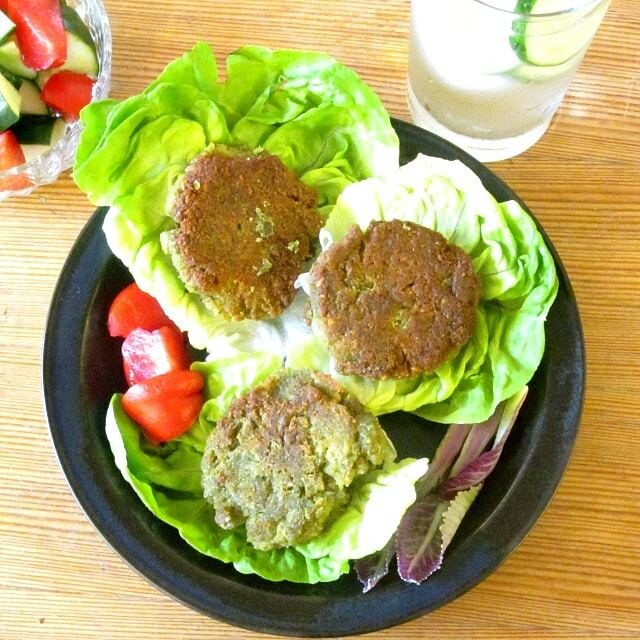 I love discovering new ways to make falafel..its fun experimenting with this dish..your recipes sounds great! 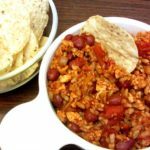 It's a great dish - and so much easier than I used to think! Thank you! 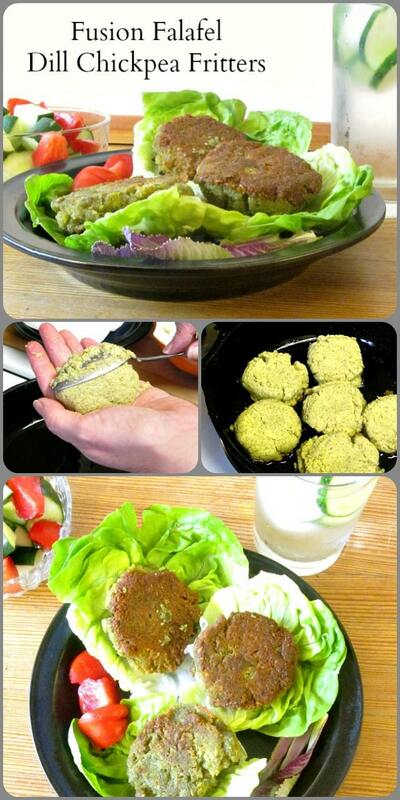 Your version of falafel looks so beautiful and YUMMY! The dill worked so well - and a stopgap measure turned into a recipe! So glad you like it - thank you! Those patties make my mouth water. No kidding. I can just eat them like that. Yum. Can we freeze the leftovers? Thank you! Well, they can be reheated in a pan, or the oven (don't microwave, they're mushy) but they're never as good again as when fresh. So, technically, yes, and certainly you can in a pinch. But if I have any choice, I'd rather freeze the raw mixture and then cook it fresh - so much better. Thank you for asking! 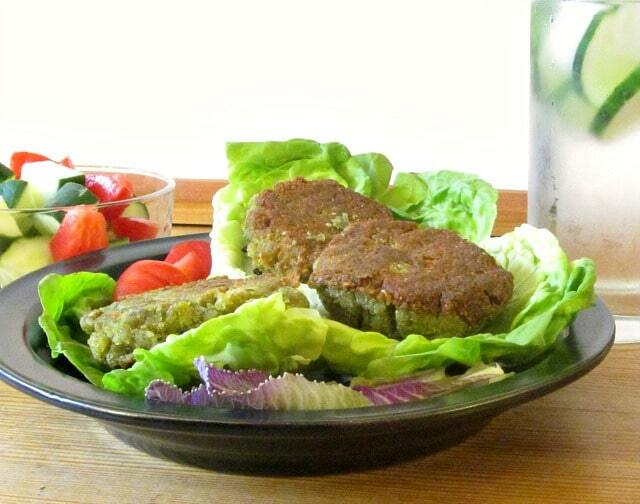 Your falafel recipe looks so delicious! There is nothing like fresh falafel!! Looks great and tasty!